Southern Illinois University Edwardsville welcomed more than 800 prospective students and guests to campus Monday, Feb. 20 for Preview SIUE. A second spring program is scheduled for Friday, March 17. The spring Preview SIUE events combined will be the largest ever spring visit programs at the University. The day-long program provided an opportunity for high school and transfer students to learn more about the University’s array of academic programming, student life opportunities and available support services. For more information, visit siue.edu/visit/. 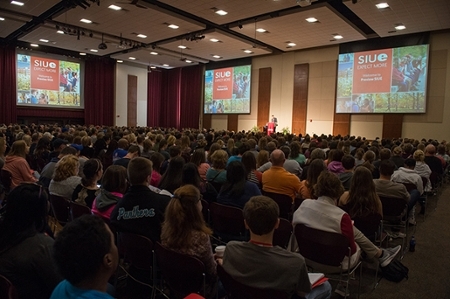 Photo: SIUE welcomes more than 800 prospective students and guests to campus for Preview SIUE.